We all love to use the perfect apropos aphorism to punctuate our writing. 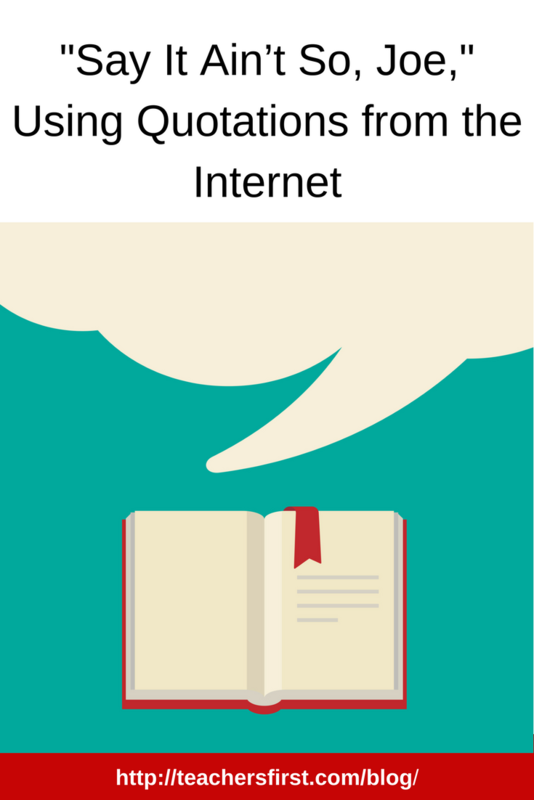 Quotations by famous people to prove a writer’s point fill social media posts. How many choice memes are graced by just the right epigram? It just may be too easy find an appropriate quotation online as we have seen by the proliferation of misquoting. You have probably laughed at the meme of Abraham Lincoln’s picture with the quote, “The problem with quotes on the Internet is that it is hard to verify their authenticity.” As reported by The New York Times, many of the fake Lincoln quotation memes were created after a tweet in honor of his birthday mistakenly attributed another famous quote to him. Here are few other famous misquotes. Baseball season is around the corner. The most infamous scandal in baseball history was the throwing of the 1919 World Series by eight Chicago White Sox players, “the Black Sox” which included Joe Jackson. Did a young boy actually ask Shoeless Joe as he left a courtroom, “Say it ain’t so, Joe?” Turns out, no, according to the magazine American Heritage. Nor did Leo Durocher say, “Nice guys finish last,” but instead he said that they finish seventh. This Day in Quotes website details the facts. March 20th is the anniversary of the famous Patrick Henry’s saying, “Give me liberty, or give me death.” But did he really say this? It turns out, he probably did not say it as we quote it, but it takes some digging to find out the real story. No one had a copy of Henry’s speech at the time, but many people remember it. His biographer William Wirt years later used the recollections of men, such as Thomas Jefferson, to reconstruct the speech. The takeaway from these amusing fake Lincoln quotes and other examples is that as teachers, we must train ourselves and our students to be Internet detectives. Understanding how to find, verify, evaluate, and use information is the core of digital literacy and research skills. For teaching tips, see my blog post on Reliable Sources and C.R.A.A.P. This article from Skeptical Science discusses how to evaluate quotations using key questions. Did that person really say that? What is the actual context? Can you find a reliable source that attributes the quote? Can you find a primary source for the quotation? Here are some sources to help when looking for the perfect quotation, to verify if the quote is correct and if it is attributed to the right person. One of the best places to look for quotations is to use standard print reference sources. Today some of the older editions in the public domain are available online. Maybe your school or public library has reference copies, too. Using books provides a good place to discuss with students why everything is not available online or why online sources may not be trustworthy. Oxford Dictionary of Quotations, 8th edition. You may be lucky enough to access to the online edition through a library as part of Oxford Reference, a paid subscription. Bartlett’s Familiar Quotations, now in its eighteenth edition, is available as a paid app as well as in print. However, the older versions in the public domain can be accessed for free in several places, most often at the website Bartleby. This site offers many searchable classic quotation reference works including Bartlett’s with a dozen books of quotations. Here some suggestions for online sites. TeachersFirst has a helpful collection of reviewed quotations sites. Check out this Pathfinder from the Internet Public Library that lists books and reliable websites. Wikiquote, similar to Wikipedia, has a vast collection of quotations by famous people. For science and technology quotations, try these Library of Congress suggestions. Many famous quotes are discussed in The Quote Verifier: Who Said What, Where, and When by Ralph Keyes. Searching Google Scholar and Google Books is another way to find and check on scholarly attributions of quotations. 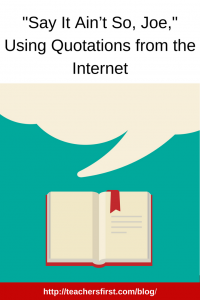 Quote Investigator is a blog that checks out the validity of quotations by many famous people. Let’s give our students the tools to become their own information detectives, critics, and curators of information, once only the purview of scholars, authors, editors, and librarians.